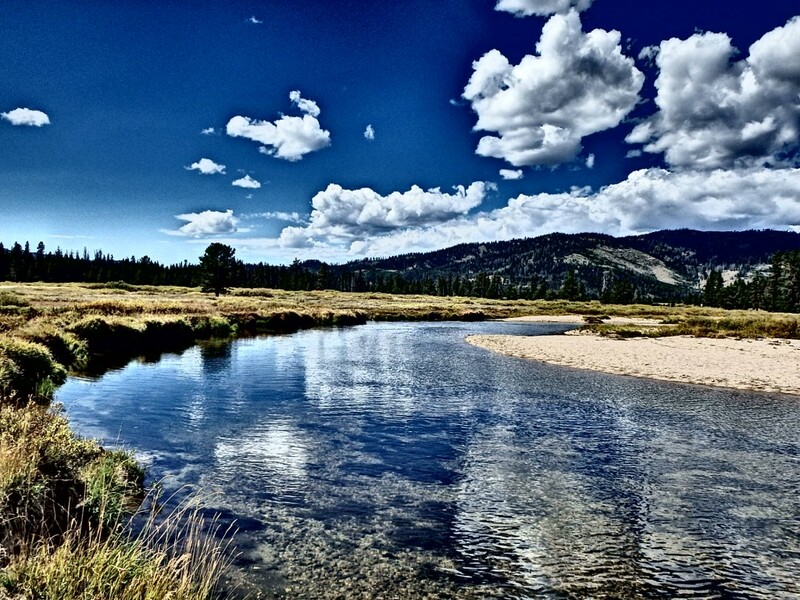 Pursuing the passion of fly fishing! Yeah! I am back in Stanley, Idaho. I have been here two weeks and the guiding season started early and furious. I truly am lucky to spend my summers here. I am going to take advantage of one last summer in Stanley! If you haven’t sorted your vacation for 2015 – give some serious consideration to visiting Stanley. Stanley, A laid back town with a lot of character! No need for parking lines. And thank to Verlon, I occasionally get a chance to fish from the boat! A rare photo of Dave and I. Yes I row and he catches! Wow – It has been a long time since my last post! 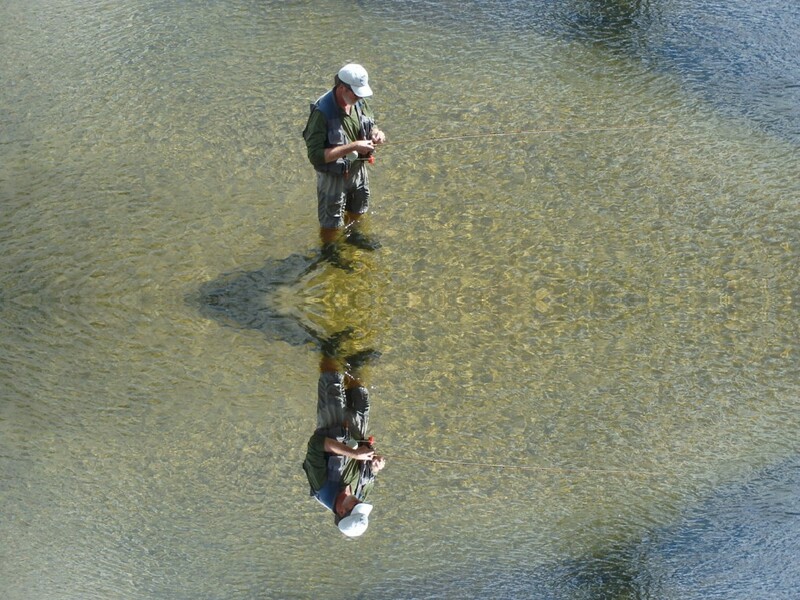 It’s not that I haven’t been fishing – but I have been extremely busy with life. 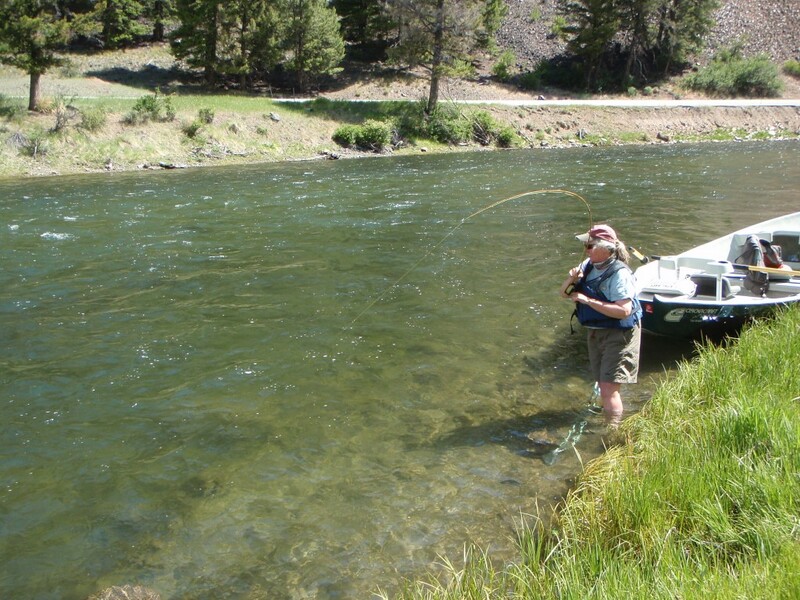 For starters – lots of days on the Salmon River this summer! No complaints here. It was a great season and the fish were keyed on big flies most of the summer. I don’t think I have ever gone through so many chubby Chernobyls. 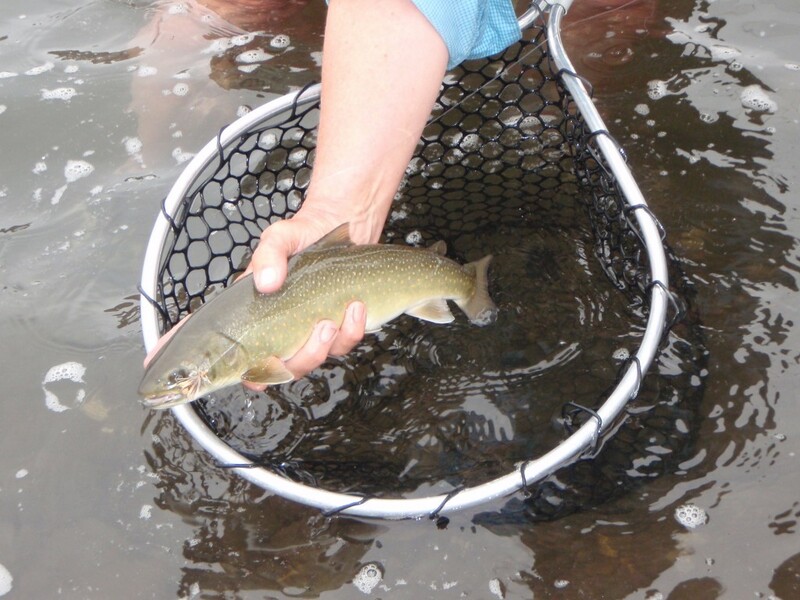 And again – the average size of the cutties continues to increase and a good number of fish over 17 inches. I continue to love my summers in Stanley and will return in 2015. Another aspect adding to no time to post on my blog – is Dave and I have made the move to Sisters Oregon. 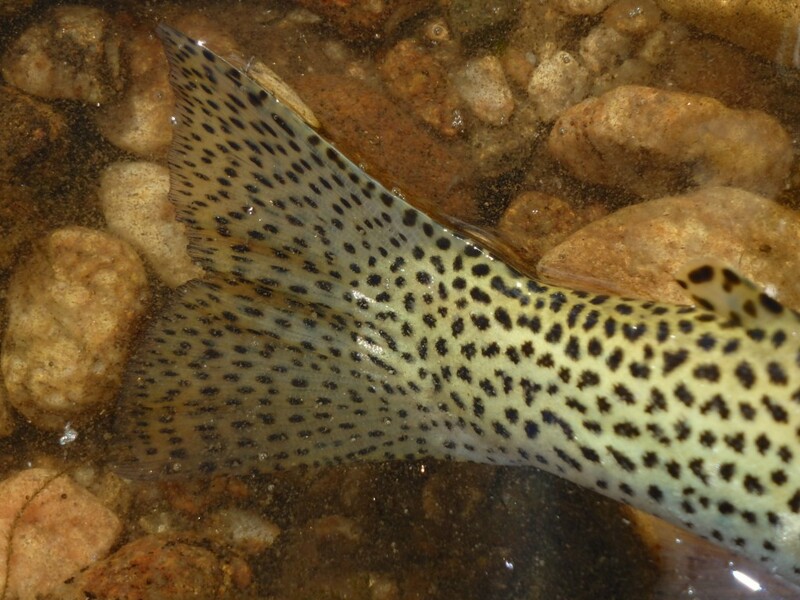 Yes after 18 years in Corvallis – we have moved closer to trout water. 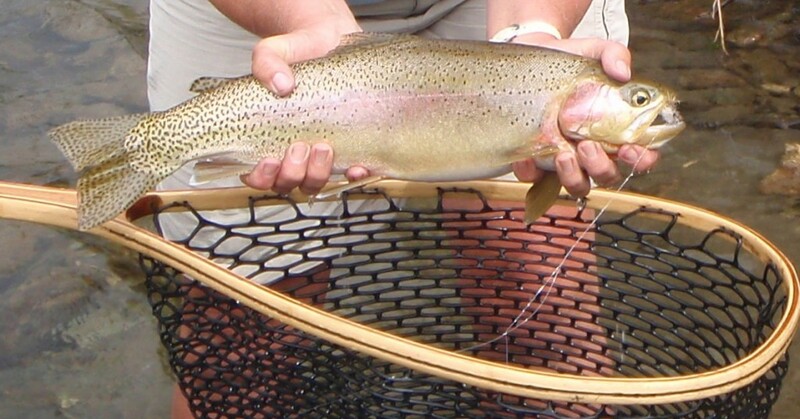 In theory we can fish for trout every day of the year in Central Oregon. I’ll do another blog on my first 6 weeks in Central Oregon. Rather than elaborate in words – I’ll let a few photos cap off the season. 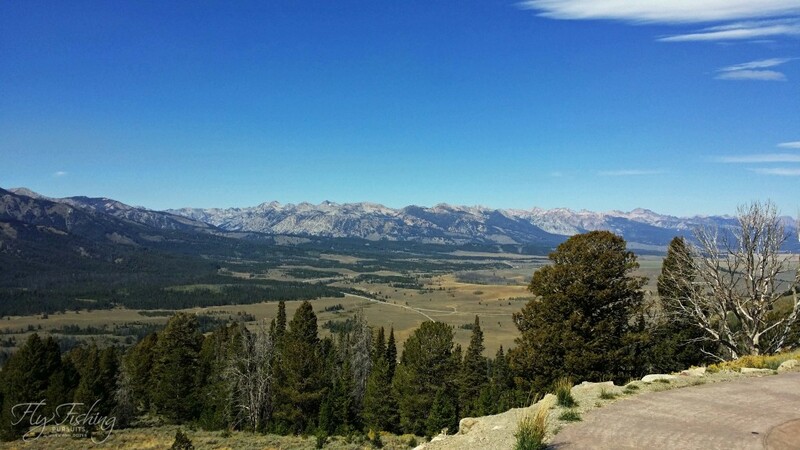 If you haven’t been to Stanley I love it not only for its great dry fly fishing for west slope cutthroat trout but for spectacular vista views. 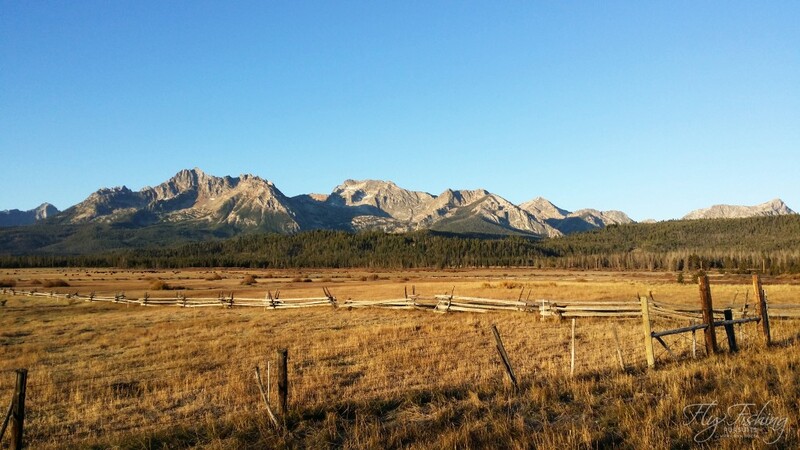 The Sawtooths – in the warm glow of the morning sun. A rare shot of both Dave and I. Of course me on the oars and Dave fishing. First fish for a new angler! Pretty great first land. 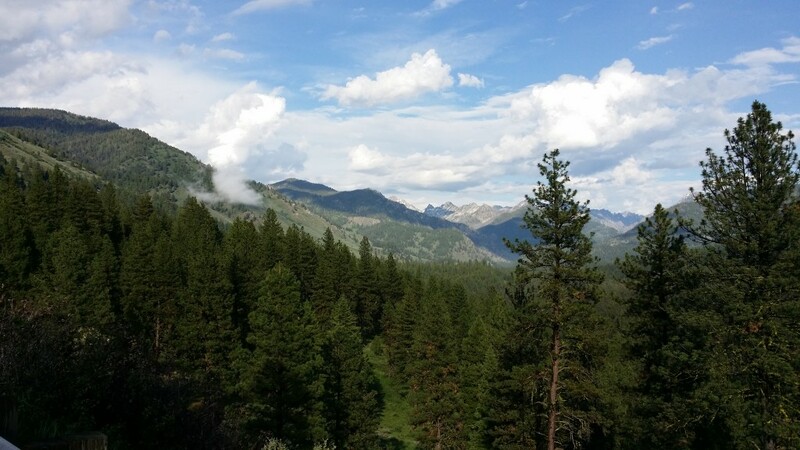 In a week, I will be leaving Central Idaho and headed to Central Oregon. 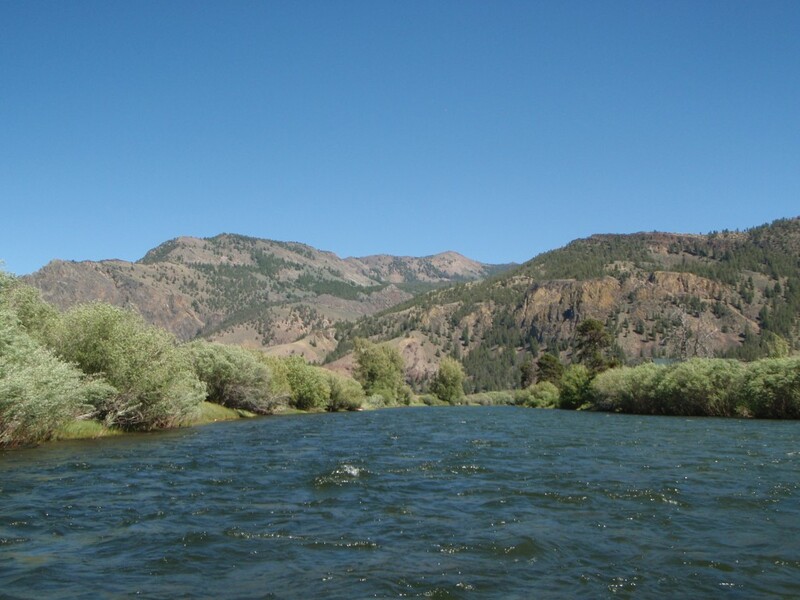 I’m always a bit sad to be heading out of Stanley – but, this year I will be spending the remainder of September and October guiding for the Fly Fisher’s Place on the Deschutes and Crooked Rivers. So this makes my exit from Stanley easier. As always the Central Idaho waters treat me well on some of my last days of the season fishing. This year is no exception. Dave and I fished west of Stanley today – in the Frank Church Wilderness. I can say we saw no-one or no car after we left the highway. No complaints from either of us. 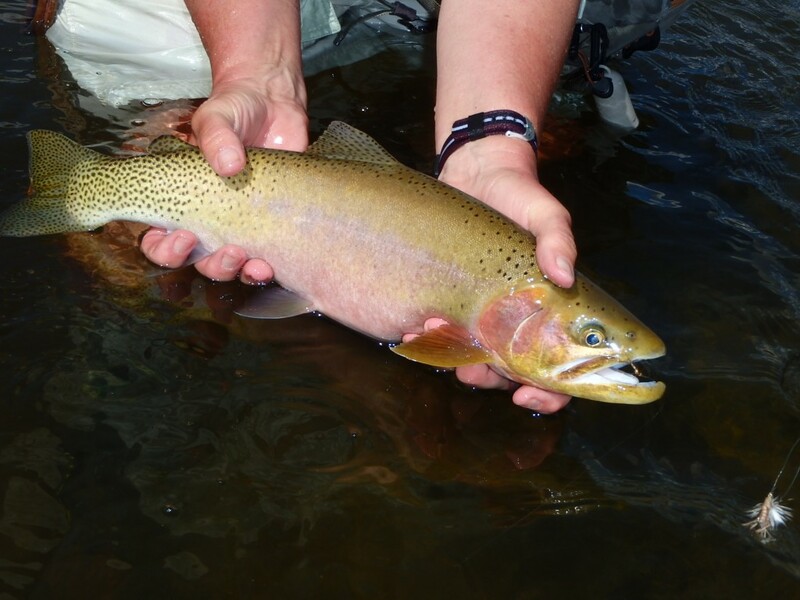 To top off a beautiful early fall day – both of us were treated to some nice native west slope cutthroat trout. This beauty (fish of the day), took a size 14 lightening bug. I landed it on my 7 ½ foot 5 wt custom made bamboo rod by Dave. As you can imagine I could feel this fish in the cork! Gotta love fishing with bamboo. A close-up so you can get a better view of the colors and spots. I also am working on getting a little more artsy with some of my photography. I hope you enjoy. 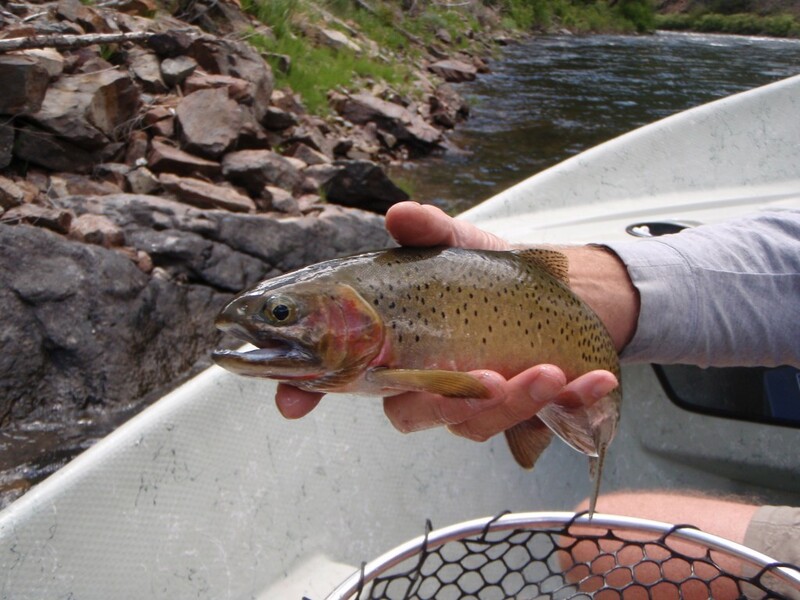 The tail of Dave’s west slope cut throat – Check out the spots! And lastly – a view of the scenery – with vivid colors! Many anglers can related to the statement “Any time you are on the water it is a good day, regardless of the number or size of your fish”. However, any angler will tell you, it’s great to land a few fish! And then they will also mention there are days that will become one of the top 5 fishing days of a lifetime. For first time anglers – many are happy when their fly line lands straight, they see a fish take their fly, and they land a fish! We all know how important it is to land a fish to get you hooked. 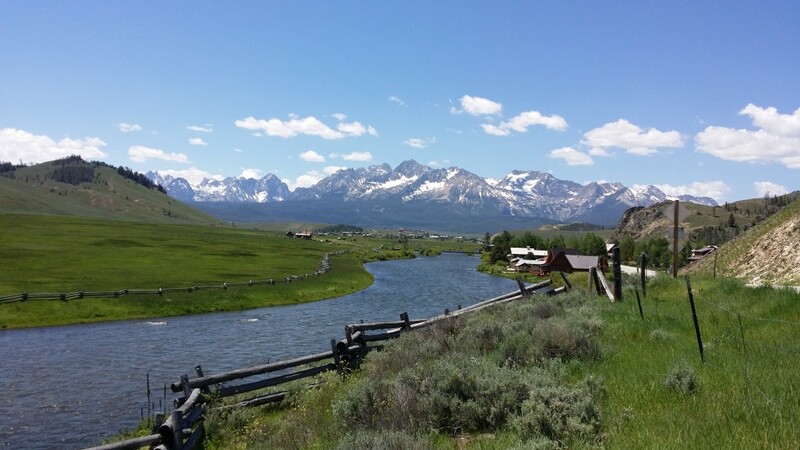 Now I need to preface my story, I met my anglers, Elle and John, at Idaho Rocky Mountain Ranch, as I arrived Elle’s mom told me that Elle had landed a 17 inch rainbow trout on the pond at IRMR, the evening before. I thought to myself, “This may be a tough day to beat last night’s fly fishing experience”. Recently, I guided Elle and her father, John. 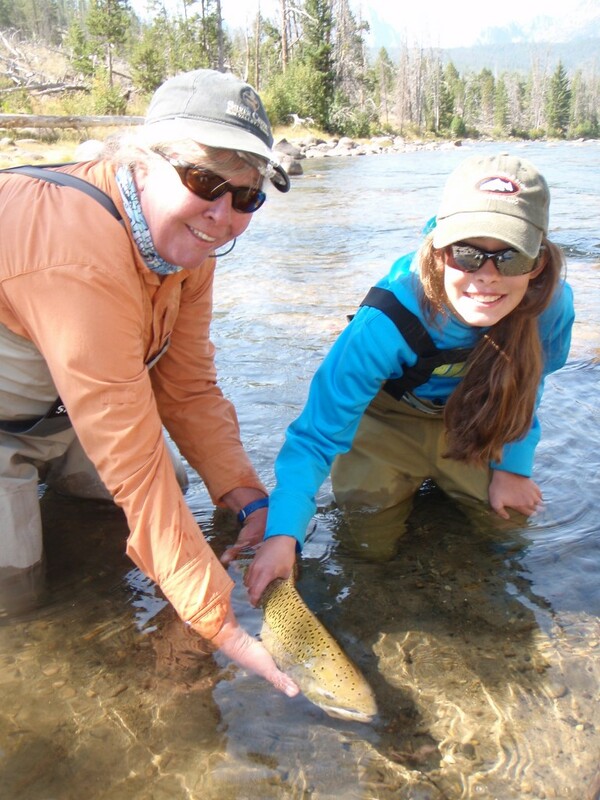 For Elle it was her first time fly fishing a river and we were targeting rainbow trout and white fish! So you can imagine it was pretty cool when she landed the first fish she hooked into. Yes a nice mountain white fish. The day was made for her with that one fish. First fish of the day! Well, to our surprise in about 15 more casts – Elle hooked and lost one big fish. Elle and I never really got a chance to see what type of fish or how big it was. We continued fishing. 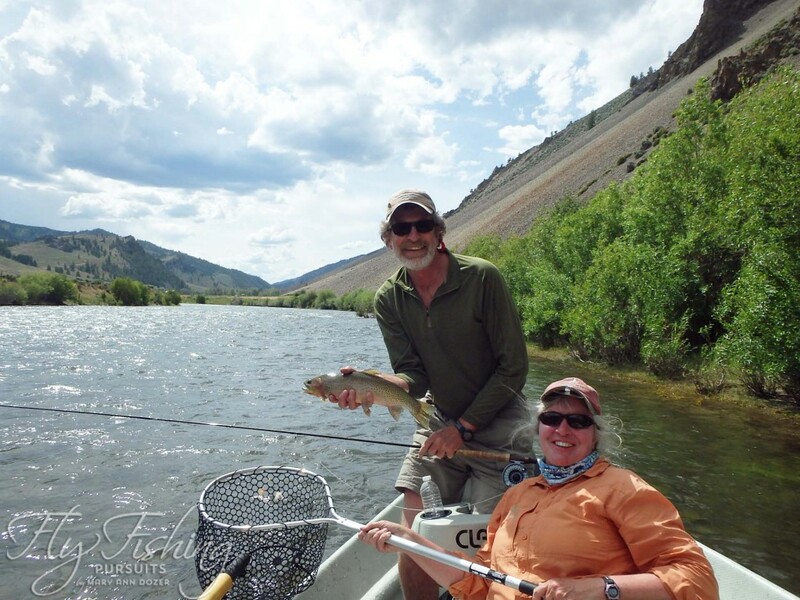 And then – we get a huge take and to our surprise it was a jack salmon that had taken her size 12 copper john. 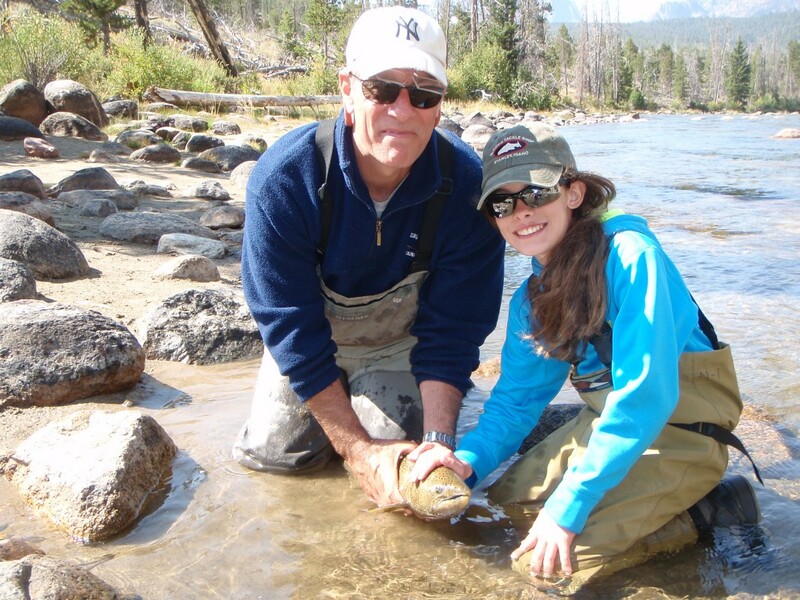 With some help, Elle landed the large jack salmon. 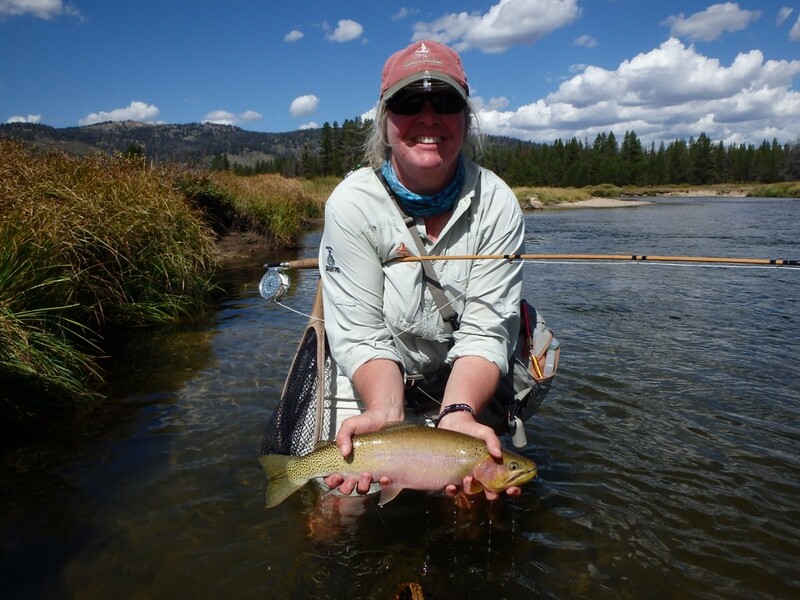 Yes one of those fish of a lifetime for any trout angler and Elle landed this on day one. 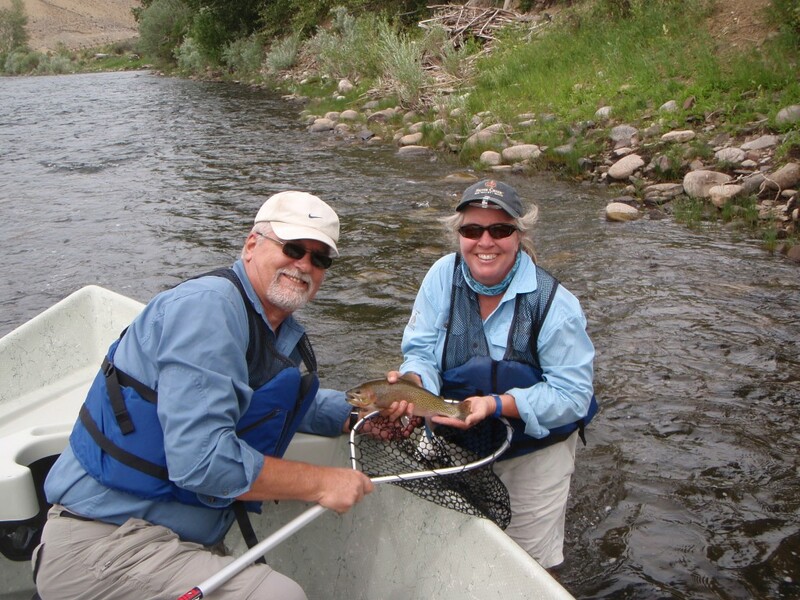 We continued to fish – missed a few small trout and to our amazement – another big take. Yes, you’re right! 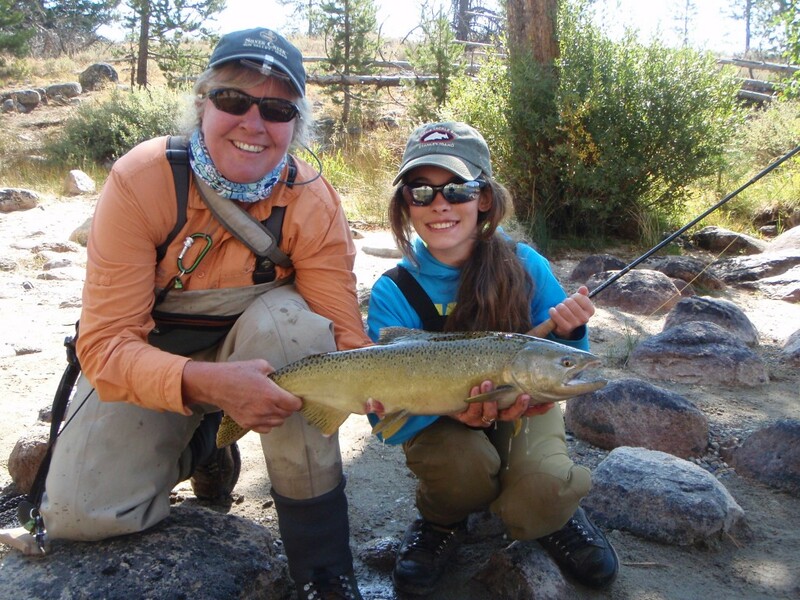 Elle is one angler with good Karma – she hooked and landed a second jack salmon. Awesome! Now all anglers know this would rank as one of those top 5 fishing days of a lifetime. 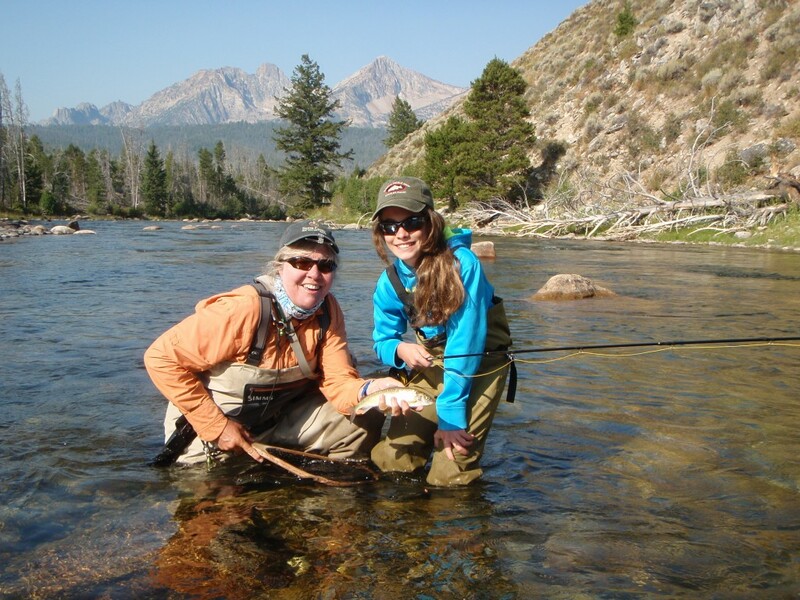 For now it is Elle’s best fly fishing day ever and in many years it will be one of her top 5 days fly fishing of a lifetime. As a guide, it was a thrill to be part of this experience with her. It clearly is one of my top 5 days on the water guiding. I just wish this fishing karma was present every day – but we all know “Regardless of the number or size of the fish, any day is good day fishing”. I don’t typically post about anglers that I guide. But I am making an exception for this day with Chuck and Craig, with their permission. Thanks Chuck and Craig for a great day! Last week, I had the pleasure guiding Chuck and his father-in-law, Craig. 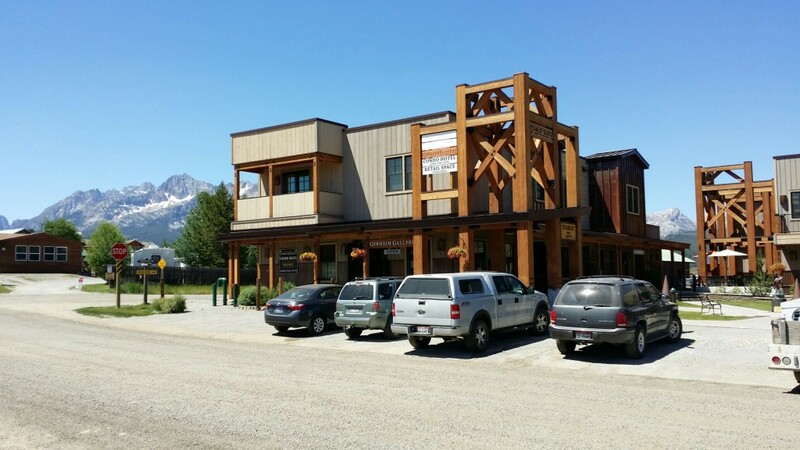 They did a short but successful trip to Stanley Idaho, to fish the Salmon and check-out the Sawtooth Mountains. Fortunately for them the river had finally cleared after a major thunderstorm had muddied up the water for 5 days. Yes – not fun, but the result of last year’s Halstead Fire and a flashflood on Basin Creek. Thank goodness that is behind us! The day started a little rocky – with a few spins on the ‘dirt’ boat ramp – but once the truck was leveled out – it was a breeze to get up the ramp. The day was very breezy – unusual to have a breeze all day. However, this didn’t deter the fishing. 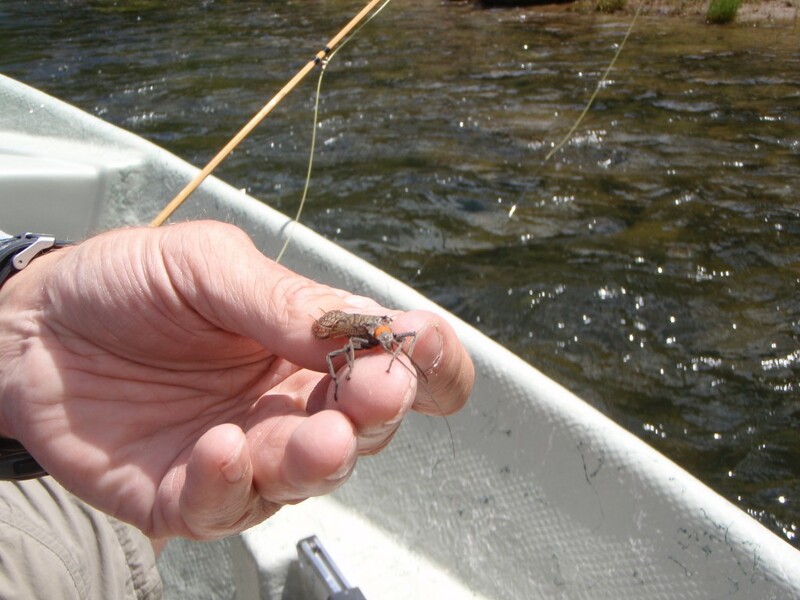 We spent the morning fishing sub-surface and then the action turned to dry flies in the afternoon. 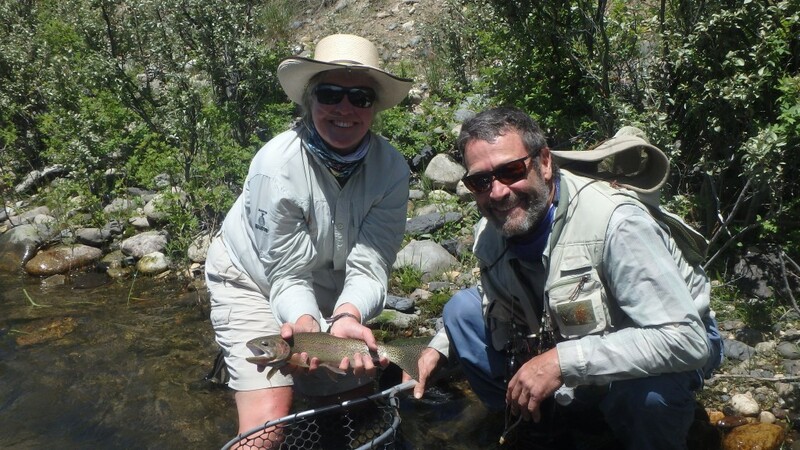 I can’t remember the number of fish we landed but I do know we landed some good size west slope cutthroat trout and mountain white fish. 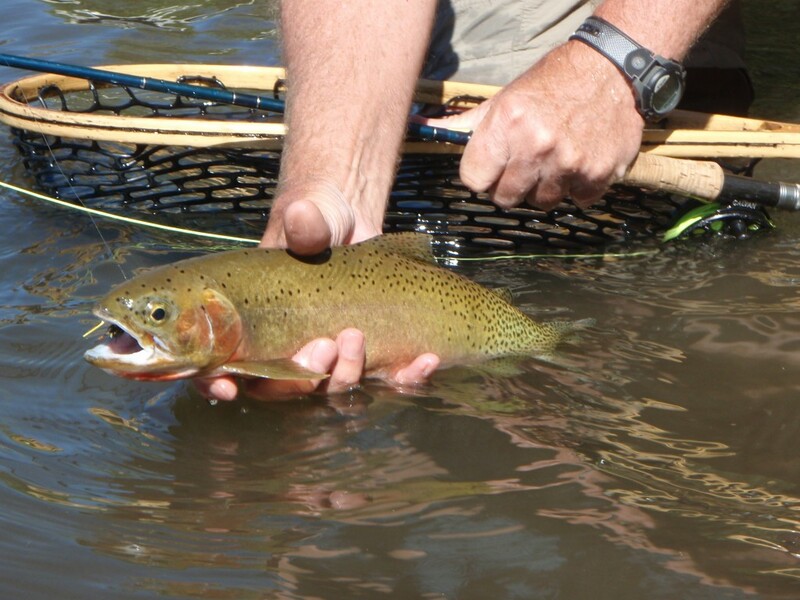 And oh did I mention the rainbow that just took off downstream and the big cuttie that was inches from the net! Thanks Chuck and Craig for a great day on the water. Chuck with one of the nice size cutties we landed. A closer look at the cuttie! Dave and I ventured out on the Salmon River for a few hours on Wednesday. 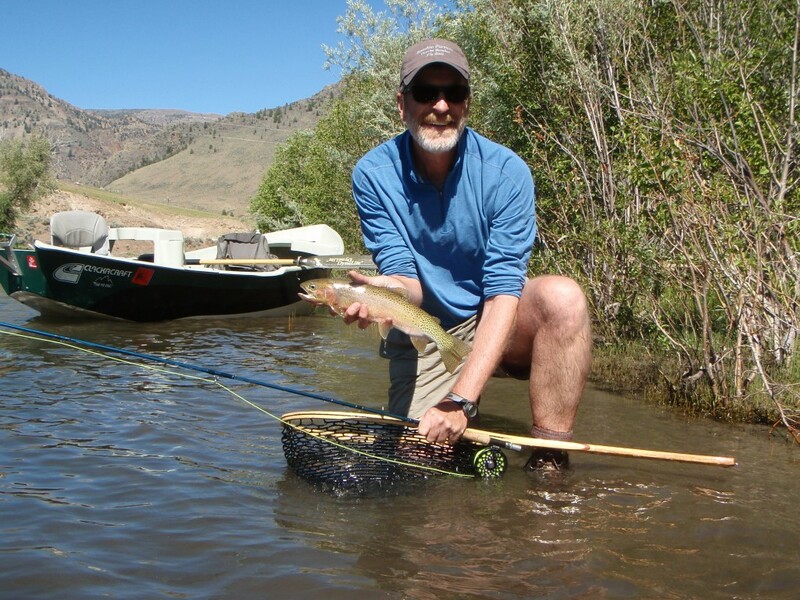 We were out to see if we could entice a west slope cutthroat trout to a swung fly and also to see how the bamboo switch rod performed. 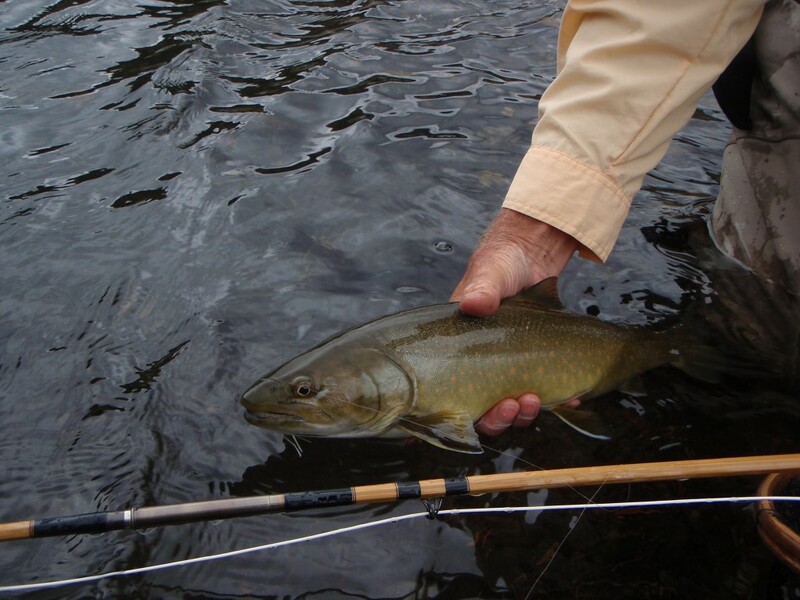 Well we weren’t able to entice any cutties, but it could be because the bull trout were very aggressive. As you can see from the photo’s the bamboo rod bends very progressively through the hole rod – allowing us to feel the fish in the cork. This is why bamboo is so cool – you can feel so much more of the take and play of a fish. Check out the bend in the bamboo rod. There is nothing like feeling the fish all the way to the cork. 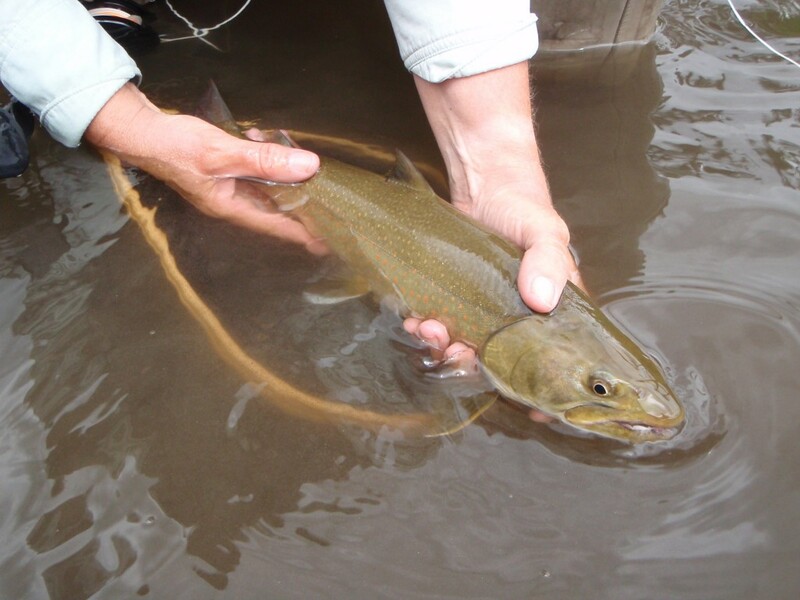 A safe release of a bull trout! Dave and I arrived in Stanley on Sunday. On Monday we were already on the water. With the lower snow pack this year the river is already in shape to float. So of course we took advantage of that! Expertly getting the boat in the water. Given I would be doing most of the rowing I just assumed that Dave would get the first cuttie of the 2013 Summer. Much to my surprise it was me. 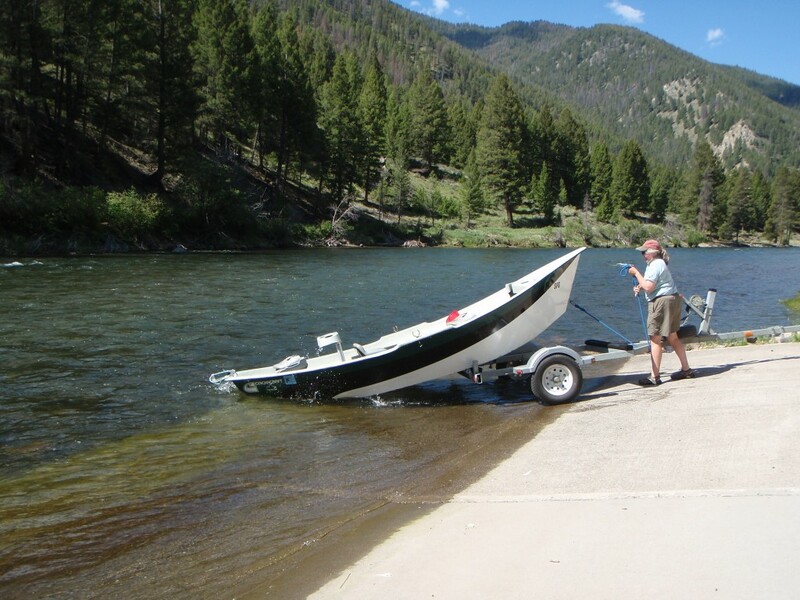 All it took was rowing to the other side of the river from the boat ramp and grabbing the best water. 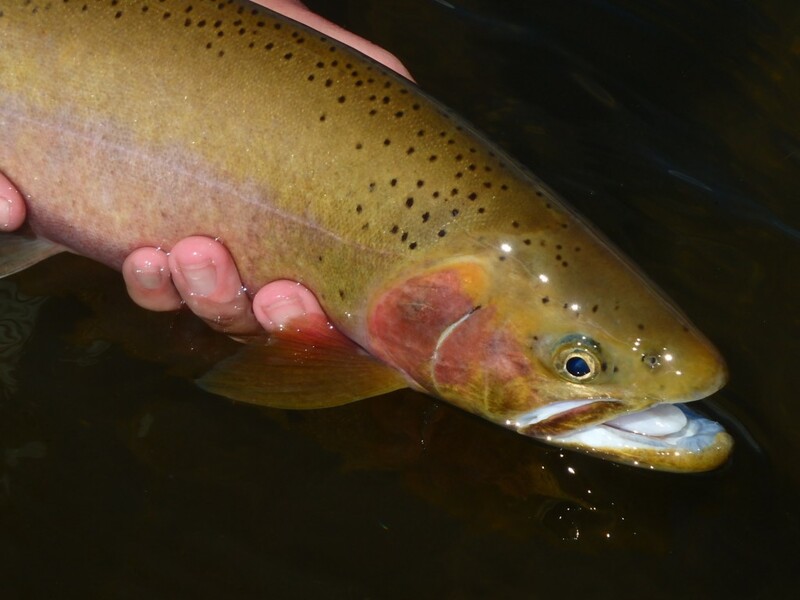 As you can see in the next few photos this was a great west slope cutthroat. Check out the colors on my cuttie! Dave did get his share of cutties for the day! One of Dave’s many cutties for the day. You may be wondering what fly was working? Well does the next picture answer that question? We saw plenty of salmon flies and golden stones flying around. In the morning we did the best on catching fish with sub-surface flies. It wasn’t till after lunch that the fish were looking up for the large dry fly imitations of the Salmon Fly and Golden Stone. 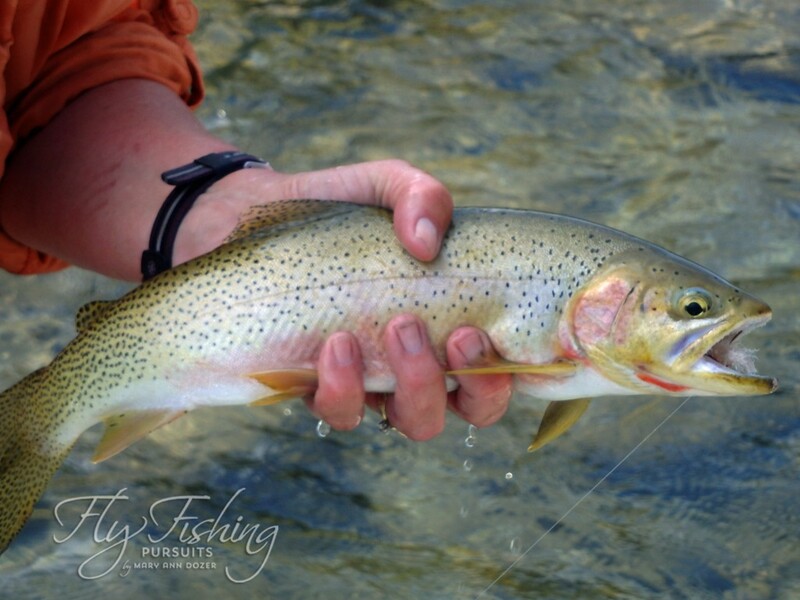 When they started to look up – there were plenty of looks and a good number of the slow west slope cutthroat take. Dave and I fished the Salmon River in mid-September. We were on the upper reaches of the Salmon and found a nice spot to fish. Below is a video of my last fish of the summer. 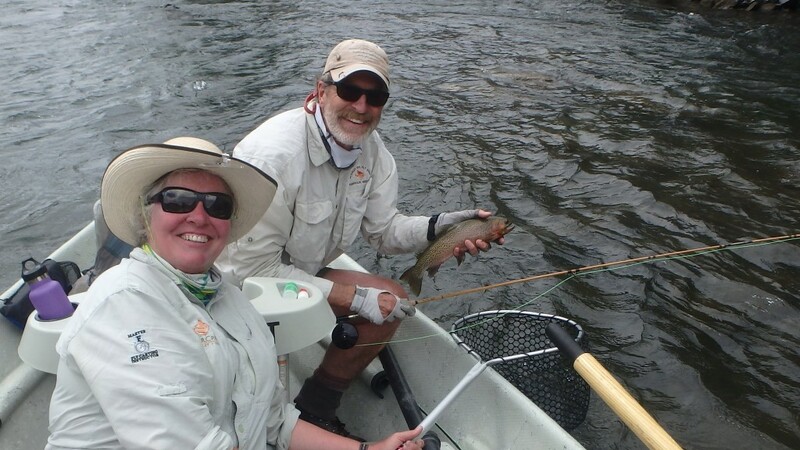 We got into a lot of fish – this last morning of fly fishing – including a nice 18 inch cutthroat. Most importantly check out my last fish of of my 2012 summer on the Salmon River. 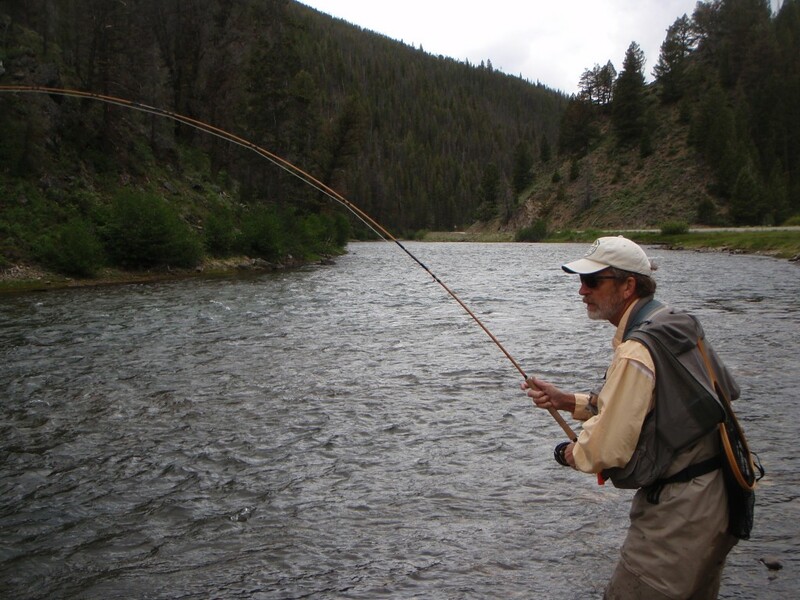 I was fishing a 7’6′ 5 wt bamboo rod and swinging a JJ Special Streamer. 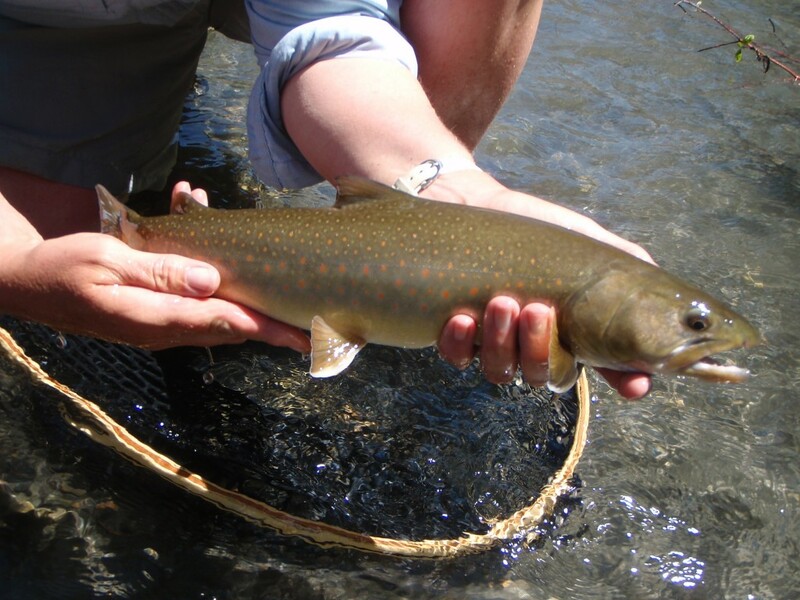 The bull trout was sitting in the tailout! It has been a busy summer for me on the water. My goal was to do a weekly blog post. Well this is probably my one blog post till the end of my season mid September. I guess I shouldn’t complain. 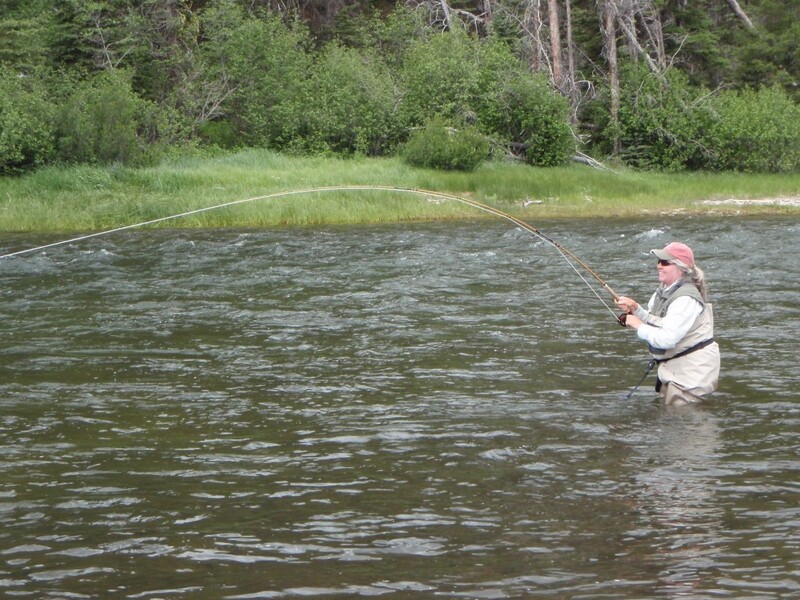 Fishing has been great on the Salmon River – we have had a few slow days, but all in all the fishing has been good. 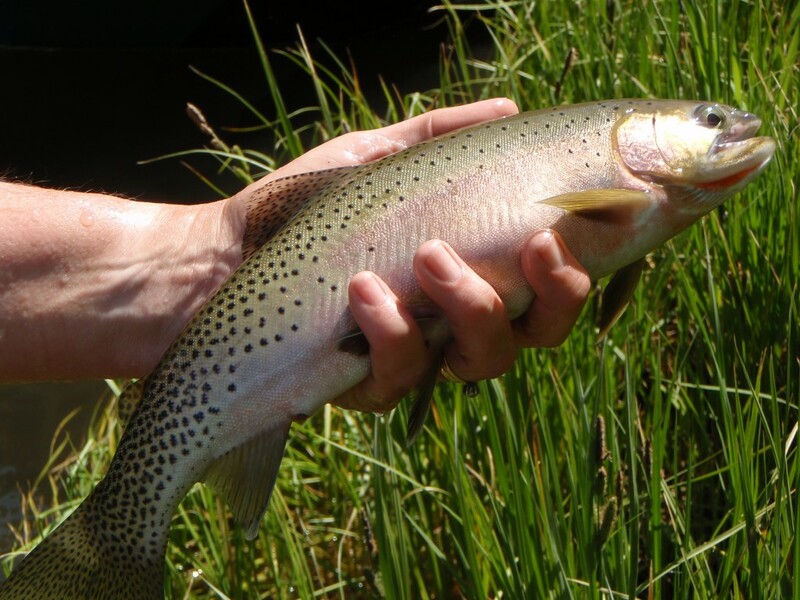 This year we are seeing larger West Slope Cuthroats than last summer. So that is great. Check out the following photo of one 20 plus cut throat and the video of another one closer to the 16 -17 inch range. You know one of my post would not be complete unless there was a photo or video of a fish that Dave landed with his bamboo rod…so here it is! 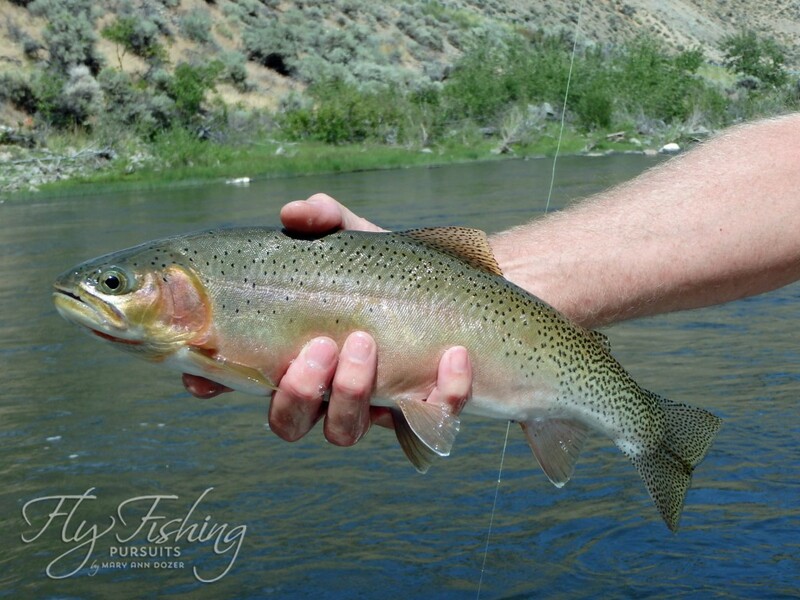 And just in case you aren’t a fly fisherman there is plenty of scenery and animal life to check out! 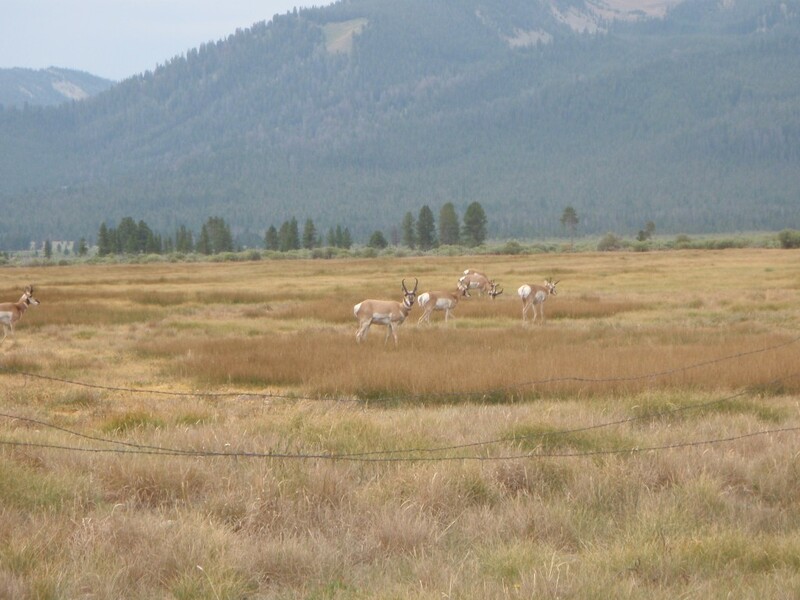 South of town there is a herd of Antelope that you can view grazing! Dave and I have floated the Salmon River the last few days. 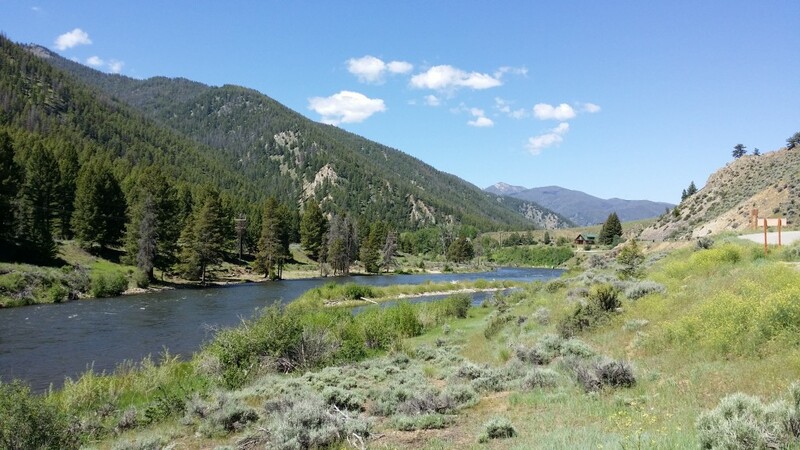 The water is running fast – 2300 CFS – but still very fishable. We have seen hatches of Golden Stones, Salmon Flies, Green Drakes, Black Caddis and a few Yellow Sallies. 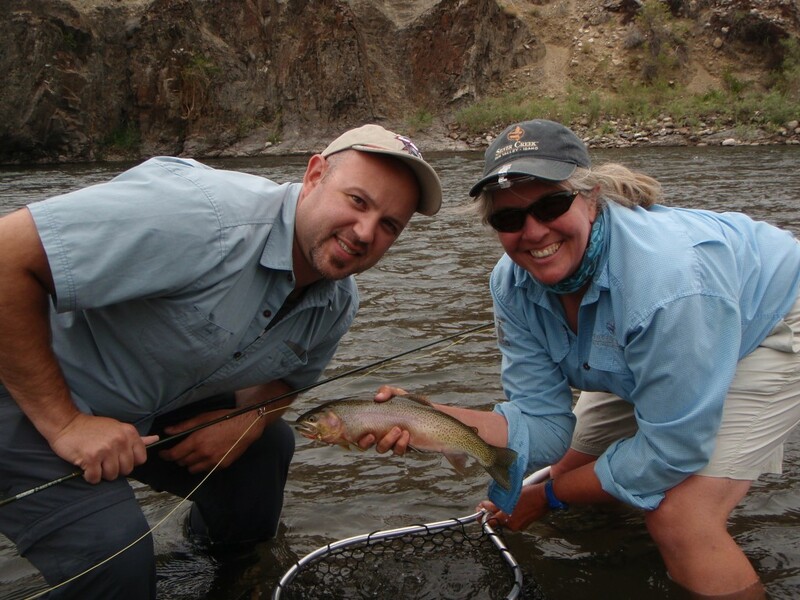 Where ever the current was walking pace – we always found a willing west slope cutthroat to take a dry fly. 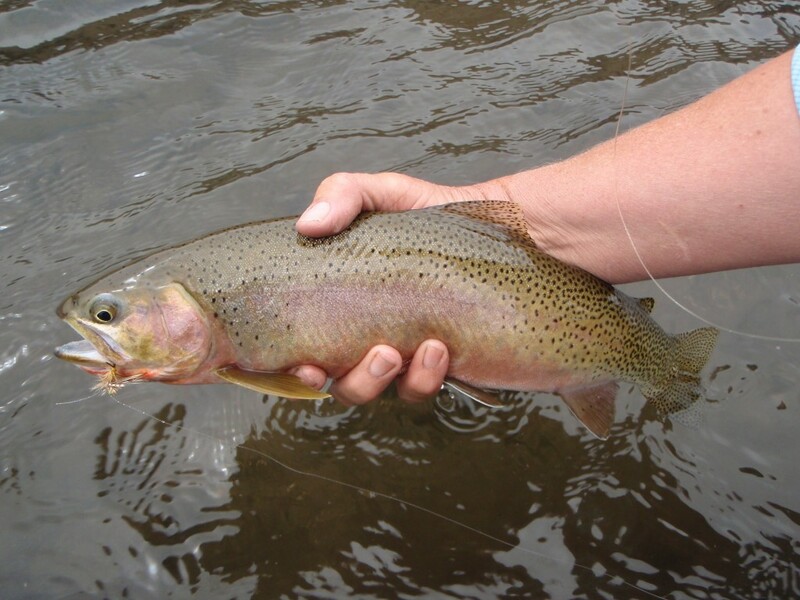 Stripping streamers – yuk bugs and JJ Special’s also produced fish early or later in the day. 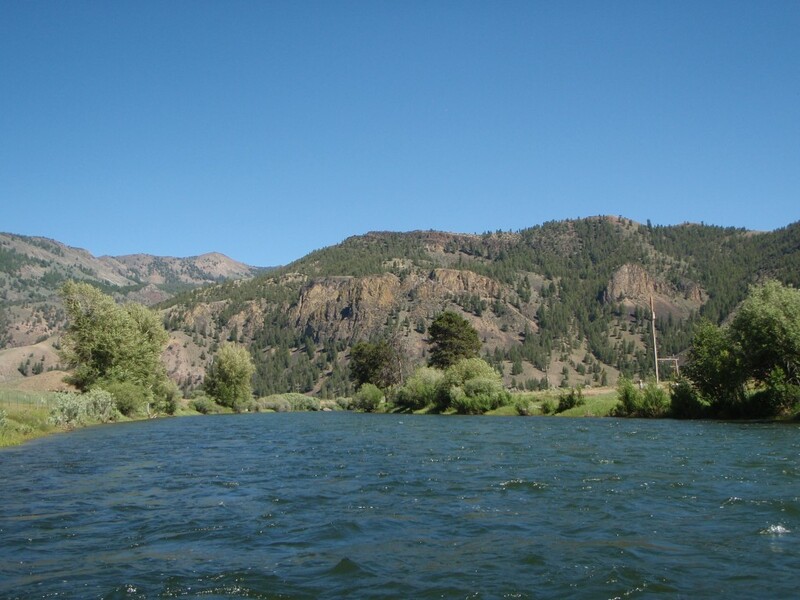 For those of you who are not fishing enthusiasts – I will share a few photo’s of the vistas one will see floating the Salmon River. 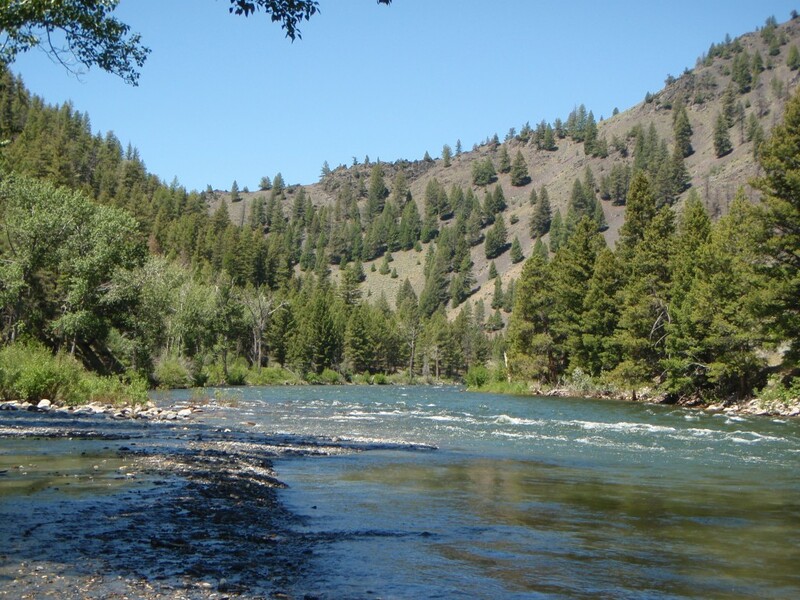 So you don’t have to be a angler to love the Salmon River. 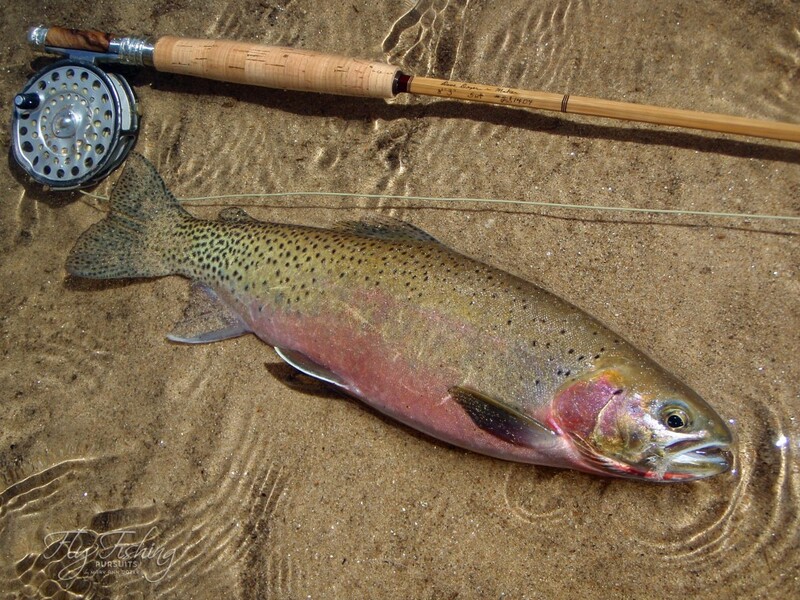 For those you who are fishing enthusiasts – enjoy a few photo’s of today’s landed fish! 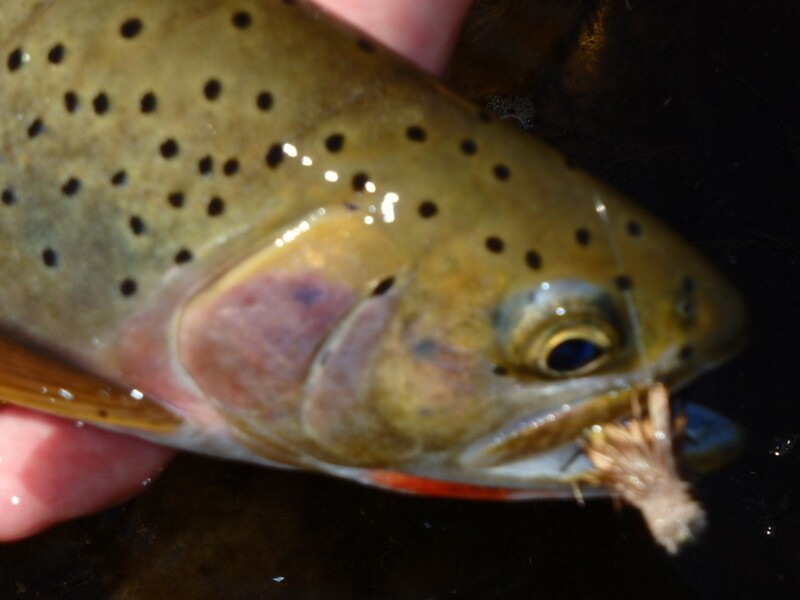 The biggest cutthroat of the day was landed 100 foot from the take out! Take a closer look at this cuttie! Gotta love the colors in these fish! Thanks for viewing this post!